Sleep Apnea? Help May Be as Close as Your Dentist’s Office! Getting a good night’s rest is often the difference between having a good day or a bad day. It’s also a key component of health. Yet there are many things that prevent healthy sleep, and over recent years, one of the most common physical factors that’s emerged is sleep apnea. This sleep disorder is marked by abnormal pauses in breathing, which can last anywhere from several seconds to whole minutes. Sometimes it happens due to faulty signaling between the brain and muscles that control breathing – a fairly rare condition called central sleep apnea (CSA). Much more common is obstructive sleep apnea (OSA), which occurs when the airway is partially blocked by either the soft tissues lining it or even the tongue falling back as one’s muscles relax. (The sound of snoring is made by the force of air against those obstructions as you try to keep breathing.) The recent increase in OSA rates is largely due to two factors: the obesity epidemic (more tissue that could block the airway) and an aging population (we lose muscle tone in our later years). And yes, CSA and OSA can happen together – a condition called complex sleep apnea, although there appears to be some debate on the matter. But so long as you start breathing again, what’s the big deal, right? Quite a big deal, actually, and far beyond the exhaustion some people suffer without proper rest, which raises risk of automobile accidents and workplace injuries. Research has linked sleep apnea to a host of other health problems, including heart disease, diabetes and high blood pressure. A study published just last year in the Journal of Periodontal Research showed a relationship between OSA and gum disease. Another – published in the American Journal of Respiratory and Critical Care Medicine – found that those with severe sleep apnea are four times more likely to die of cancer than those without the condition. Yet one of the challenges is that most who suffer from sleep apnea don’t know it until someone points it out – a family member, roommate, spouse, partner. Or they complain of chronic tiredness to a doctor who may consider sleep apnea as a cause if multiple risk factors are present. Or they suspect it may be a problem and take one of the many online tests available to get a better idea of their risk. It used to be that use of a CPAP device was the only real option for dealing with sleep apnea – a machine that uses mild air pressure to help keep the airway open. 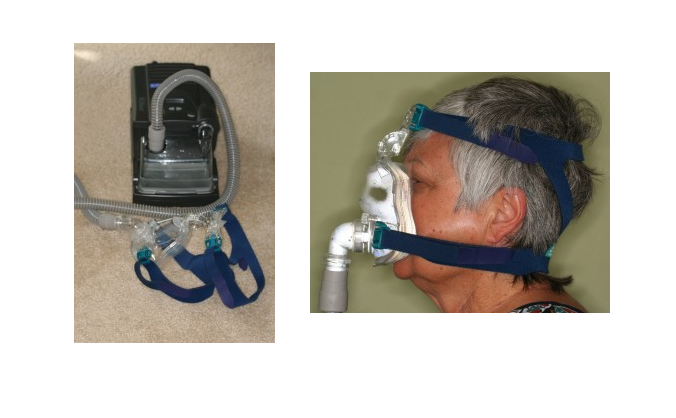 (“CPAP” stands for “continuous positive airflow pressure.”) This is what Rosie O’Donnell used to deal with her condition, as she discussed on The View with sleep specialist Dr. Michael Breus. One look at the device and you can probably imagine why so many people who might benefit quit using it – or never start. While CPAP may still be the best option for severe cases of apnea, there’s an ever-widening range of treatment options for those with mild to moderate conditions, including oral appliance therapy that a dentist can provide. Like some of the splints provided for help with nighttime bruxing (clenching and grinding), dental devices for apnea often look like sports mouthpieces on a serious fitness kick. Yet they’re light and extremely comfortable, custom fit for each patient needing help with their sleep disordered breathing. Those we’ve treated in our office have expressed great relief once they’ve begun their therapy. Many are amazed at just how improved their sleep is – how much more rested they feel upon waking, how much more energetic through the day. Comments Off on Sleep Apnea? Help May Be as Close as Your Dentist’s Office!